It's never a dull moment for Jamie (Sam Heughan) and Claire (Caitriona Balfe), and this week's Outlander was no exception as the fan favorite couple arrived at River Run. Between meeting Jamie's Aunt Jocasta (Maria Doyle Kennedy) and learning about the laws of the land, fans were given plenty to mull over until next week's installment. We're breaking down some of the episode's most pivotal points, but beware of major spoilers. 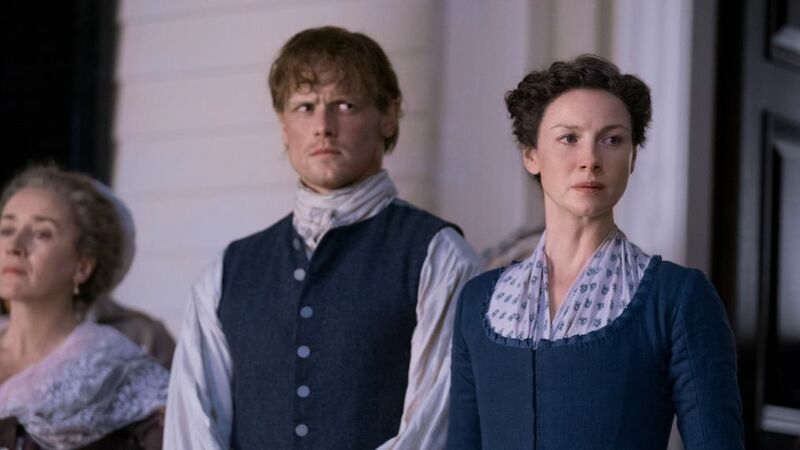 Picking up where the Season 4 premiere left off, Jamie and Claire are dealing with the aftermath of Stephen Bonnet's (Edward Speleers) attack as their river boat docks at the sprawling plantation known as River Run. Despite Jamie's consternation, he greets his Aunt with unfiltered joy. Happy to see someone from his MacKenzie side of the family — Jocasta is sister to Jamie's mother and uncles Colum (Gary Lewis) and Dougal (Graham McTavish) — Jamie quickly introduces Claire who is initially pleased to make Jocasta's acquaintance. When Ian (John Bell) steps in with Rollo, we soon discover that Aunt Jocasta is partially blind and she can't see a bundle of flowers her great nephew is handing her. It's then that Jocasta also reveals her ability to detect truth, something that would later cause a rift between her and Claire. As they enter the main house, Jocasta assures her visiting family that they are welcome to stay as long as they need, considering their recent ordeal with Bonnet. As Jamie and Claire are ushered to their quarters they also meet Ulysses (Colin McFarlane), Phaedre (Natalie Simpson), and Mary (Mercy Ojelade) — slaves of River Run. Of course, Claire asks that she be called by her name without the proper address, despite knowing that it's unusual for the time. She's then horrified when she peers out her window to discover many slaves working in the fields of River Run. Later on, Jamie attempts to address the topic with his aunt asking how many slaves Jocasta owns — she reveals that she keeps over 150 of them. Claire, irked by this realization, asks Jocasta if the slaves are happy to be there considering they have no choice in the matter. She responds that only a few have tried to run away over the years. Meanwhile, a party is in the works to celebrate Jamie and Claire's arrival but they aren't making a great impression on the locals. Jamie's advice for Jocasta's crops and Claire's stance against slavery prove to be detrimental. Jamie's aunt names him the heir to River Run at the gathering, while Claire wants nothing to do with owning slaves. In order to clean his hands of such atrocities, Jamie reveals plans to free them but is advised against it — doing so would apparently be costly and hinder the "lifestyle" of plantation owners. This causes Jamie to reconsider the land-sharing offer he received in the premiere, in which he and Claire would recruit people to move overseas for colonization. In the midst of this uncertainty, one of Jocasta's plantation workers arrives with news of a violent act by a slave against one of the crop overseers. Jamie and Claire rush to the scene on her behalf to find a slave named Rufus suspended by a rope and hook from a tree by the man he injured. They learn he sliced the man's ear off, and the punishment for a slave's act of violence against a white individual is death. However, the cruel, unlawful treatment of Rufus pushes the couple into action. Leaving the earless man behind, Claire's first instinct is to treat the impaled slave and bring him to the main house for surgery. And while Claire might mean well, she ultimately causes more harm than good. After removing the hook from Rufus' abdomen, he awakens from surgery successfully, but Ulysses tells her she would have been better served to have left him on the hook. An angry mob arrives at River Run demanding the proper justice, and Claire knows that she can't stop the locals from carrying out their barbaric justice, so Jamie suggests that she do what she did with Colum — essentially an assisted suicide. Rufus will meet the hangman's noose, but Claire's tea laced with a life-ending sedative saves him from dying in a brutal manner. Meeting their promise to deliver Rufus at midnight, the angry mob drags his body to a nearby tree for hanging, setting the tone for River Run's way of life. Below, find some of the noteworthy and key moments to keep in mind as the season progresses. Considering Claire's Hippocratic Oath as a doctor, the episode's title of "Do No Harm" is telling — did she do more harm by saving Rufus only for him to end up being killed? Could this impact Claire's decision-making as a doctor and healer in the future? It's definitely not going to help her strained relationship with Jocasta. Ian and local John Quincy Myers (Kyle Rees) discuss "Indians," a population that Ian recognizes to be similar to the Highlanders. Mr. Myers commends Ian for his observation, as many others regard them as savages. Will the newfound information Ian's collected help him in the future? According to next week's episode preview, a run-in with the natives is on the horizon. What will happen between Jocasta and the Frasers? It's clear that they are strong-willed, but not about the same things as Jamie's aunt. How will their exit from River Run go? We can't wait to see. The preview for next week's episode hints at appearances by Brianna (Sophie Skelton) and Roger (Richard Rankin). It's been a while since fans last saw them, so it will be interesting to see where their story picks up.